Plants need certain basic components to grow well. These components include seeds, soil, water, sunlight etc., Plants get all the essential nutrients through the soil. But in today's concrete world filled with flats and apartments, getting a place with good soil to grow the plants is impossible. No need to get discouraged. There are alternative techniques to grow plants without soil. In the previous blog, I had discussed about Aeroponics. Here is another way to show your affection towards the plants. It is hydroponics. This is an innovative technique to grow plants without soil. Hydroponics is the method of growing plants without soil, using mineral nutrient solutions and water. The roots of the plants are immersed in the water containing nutrient solution. The nutrients provided to the plants in hydroponics are mostly the byproduct of fish waste, duck manure, or normal nutrients. The word Hydroponics has derived from Greek words where Hydro means 'Water' and ponos means 'Growth'. An author and botanist named Francis Bacon was the first person who started the Hydroponic system. In the year 1627, he wrote a book called 'Sylva Sylvarum' or 'A Natural History' which contained the details about growing a terrestrial plant without soil. Since then, many research was conducted to study about hydroponics. In 1699, another author named John Woodward published an article about water culture experiments with spearmint. He had grown two plants, one in normal water and another in pure distilled water. He found that the plants which were grown in normal water sources grew better than plants in distilled water. Two German botanists named Julius von Sachs and Wilhelm Knop conducted an experiment from 1859 to 1875 and came up with a list of most essential components to carry out Hydroponics. This gave a big positive impact towards the development of soilless cultivation of plants. The growth of terrestrial plants without soil in mineral nutrient solutions was then called as solution culture. Many research and teaching technique were conducted and is still widely used as a growing technique. Solution culture is now considered as a type of hydroponics where there is no inert medium. How do the plants grow in Hydroponics? The plants are provided with required nutrients for its growth. If you give a plant exactly the nutrients it needs at the right time in a correct quantity, the plant will be as healthy as is genetically possible. With hydroponics, this is an easy task compared to soil. The plants are grown in an inert growing medium and a perfectly balanced, pH adjusted nutrient solution is delivered to the roots in a highly soluble form. This allows the plant to absorb the required nutrients with very little effort when compared to soil where the roots must search out the nutrients and extract them. This is true even when using rich, organic soil and best nutrients. The energy expended by the roots in this process is energy better spent on vegetative growth and fruit and flower production. If you grow two plants of the same kind using soil for one and hydroponics for the other, you will almost immediately see the difference in their growth. You can find faster, better growth and comparatively good yield from hydroponics. These are the reasons that hydroponics method is adopted for commercial food production as well as by hobby gardeners at home. There are many types of hydroponics used across the globe. Some of the best hydroponic systems are made of different types of hydroponics into one hybrid hydroponic system. Here are some of the easy and commonly used techniques. 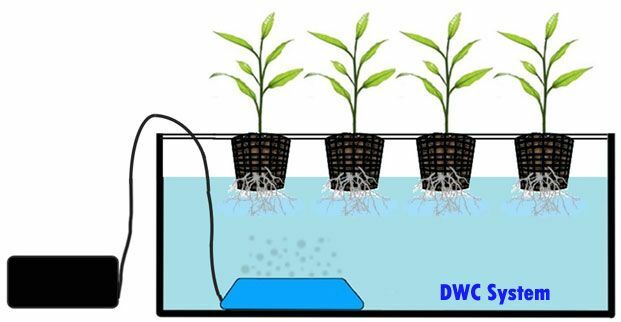 Deepwater Culture method which is also known as the reservoir method is one of the easiest methods for growing plants with hydroponics. 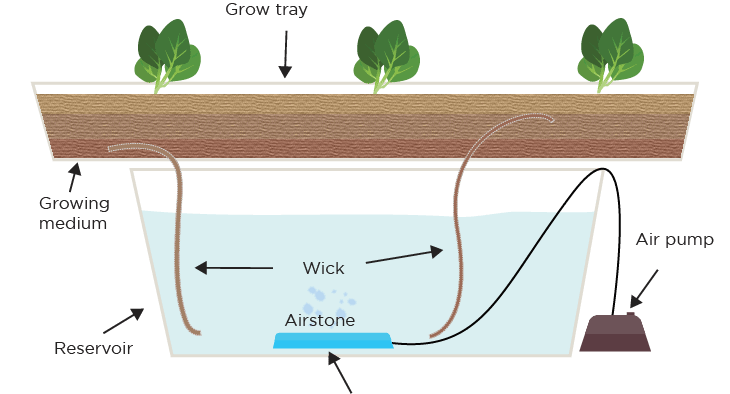 In this method, the roots are suspended in a nutrient solution. An air pump is introduced to oxygenate the nutrient solution in order to avoid the roots of the plants from drowning. You need to prevent direct sunlight from penetrating the system, as it can support algae growth and hence the whole system gets affected. The primary benefit to using a Deepwater Culture method is that there are no drip or spray emitters to clog. This makes the system a perfect choice for organic hydroponics, as hydroponics systems that use organic nutrients are more prone to clogs. The Wicking method is one of the simplest types of hydroponic system. This is a passive system, hence there are no moving parts in the system. The concept behind wicking is that you have a material such as cotton, that is surrounded by a growing medium with one end of the wick material placed in the nutrient solution. The solution is then wicked to the roots of the plant. The nutrient solution is drawn into the supporting medium from the reservoir using a wick with one end dipped in the reservoir and the other end connected to the supporting medium. This system can use a variety of supporting medium such as Perlite, Vermiculite, Foam with a hole in the center etc., The roots pass through the gap in the supporting medium to obtain the nutrients. This is the most commonly used hydroponics method across the world. This system has a constant flow of nutrient solution so no timer required for the submersible pump. 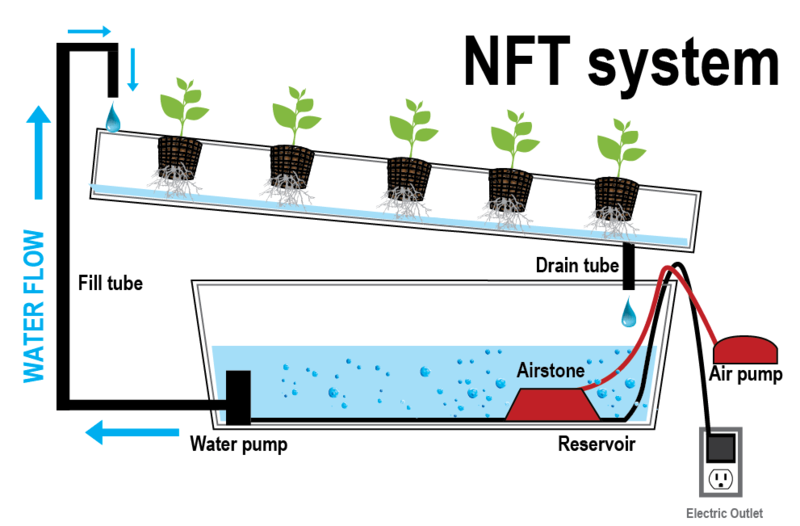 The nutrient solution is pumped into the growing tube and flows over the roots of the plants, and then drains back into the reservoir. The nutrient solution is on a slight tilt surface so that the solution will flow with the force of gravity. This type of system works very well because the roots of a plant absorb more oxygen from the air than from the nutrient solution itself. Since only the tips of the roots come in contact with the nutrient solution, the plant is able to get more oxygen which helps in a faster rate of growth. There is usually no growing medium used other than air, which saves the expense of replacing the growing medium after every crop. Normally the plant is supported in a small plastic basket with the roots suspended into the nutrient solution. Dripping method is probably the most widely used type of hydroponic system in the world. A timer controls a submerged pump in the nutrient solution. The timer turns the pump on and nutrient solution is dripped onto the base of each plant by a small drip line. In a Recovery Drip System, the excess nutrient solution is collected back in the reservoir for re-use. A recovery system uses nutrient solution a bit more efficiently. As the excess solution is reused, this also allows for the use of a more inexpensive timer because a recovery system doesn't require precise control of the watering cycles. A recovery system can have large shifts in the pH and nutrient strength levels that require periodic checking and adjusting. When it comes to the Non-recovery system, it needs to have a more precise timer so that watering cycles can be adjusted to ensure that the plants get enough nutrient solution and the runoff is kept to a minimum. The non-recovery system requires less maintenance due to the fact that the excess nutrient solution isn't recycled back into the reservoir, so the nutrient strength and pH of the reservoir will not vary. This means that you can fill the reservoir with pH adjusted nutrient solution and then forget it until you need to mix more. Growing with hydroponics comes with many advantages. Here are the advantages. a. It can increase the rate of growth in your plants. With the proper setup, your plants will mature up to 25% faster and produce up to 30% more than the same plants grown in soil. b. Your plants will grow bigger and faster because they will not have to work as hard to obtain nutrients. c. The root system gets the exact nutrients that it needs, so the plant will focus more on growing instead of struggling to absorb the nutrients. d. A hydroponic system will also use less water than soil-based plants because the system is enclosed, which results in less evaporation. e. The hydroponic system reduces waste and pollution from soil runoff as it does not use soil medium for the growth. All of this is possible through careful control of your nutrient solution and pH levels. Despite the fact that a hydroponics system has so many advantages, there are actually a few disadvantages as well. a. The quality hydroponics system of any size will cost more than its soil counterpart. b. A large-scale hydroponics system can take a lot of time to setup. c. You will have to monitor and balance your pH and nutrient levels on a daily basis. d. The pump failure can kill off your plants within hours depending on the size of your system. e. The plants die quickly if the growing medium can’t store water like soil as the plants are dependent on a fresh supply of water. The idea is excellent. Please send time to time feedback in this regards.